Mon., Oct. 30, 2017, 9:18 p.m. The Shantay Legans era arrived with a rush, which may have settled the nerves of Eastern Washington’s new basketball coach. “I was a little nervous, but it’s something I’ve been building toward … but once the game started, everything was perfect,” Legans said. It was near-perfect, too at the end, a 76-70 exhibition win Sunday at Portland that saw the Eagles win with balance and clutch plays on the road against a team from the West Coast Conference. “The most important thing is how well the guys interacted with each other,” said Legans, who took over last spring from Jim Hayford. “The guys were playing with a lot of confidence, and we shot the ball well (38.8 percent) , which I thought we would,” Legans said. 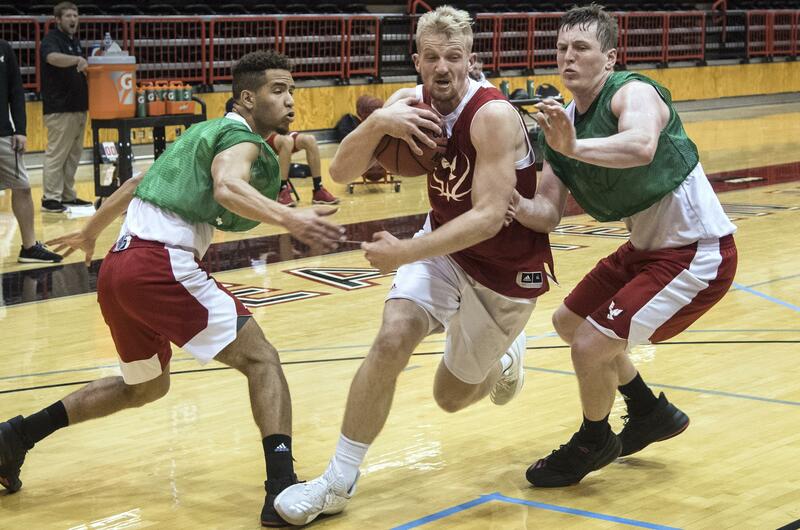 Originally, the Eagles were to open the season on Nov. 10 against Walla Walla, but last week the NCAA granted a waiver to allow earlier games as part of a benefit Red Cross relief efforts in the Caribbean following Hurricane Maria. The game was set up only a few days earlier, and the Eagles adapted on the fly. Starting point guard Luka Vulikic was held out of the game with a minor shoulder injury, but senior Sir Washington stepped in and scored 16 points on 6-for-11 shooting. Star forward Bogdan Bliznyuk “wasn’t having his best game offensively,” according to Legans, but delivered two key plays down the stretch, a driving layin and a bounce pass for a slam dunk by forward Mason Peatling. “That helped separate us a bit at the the end,” Legans said. Bliznyuk finished with 10 points on 3-for-14 shooting, but added six assists and seven rebounds. For Eastern fans, the most pleasant surprise was 7-foot transfer center Benas Griciunas, who had team highs of 18 points and nine boards. “I’ve been trying to tell people – he’s a great person and a great teammate,” Legans said. “He puts in all the hard work and he’s a great-shooting big guy who makes a lot of threes. He hit a couple of those early and it changed the way Portland had to guard,” Legans said. Griciunas also wasn’t shy about going deep, going 3-for-7 from 3-point range. Above all the Eagles got balance. Before the season, Legans talked at length about “success by committee.” By intermission five Eagles had scored at least five points. Published: Oct. 30, 2017, 9:18 p.m.